The department of Anatomy offers high quality education which enables the student to understand the basic tructure of the human body.Understanding of the anatomy of different body parts and organs and tissues of the body are important to diagnose the health problems and medical and surgical treatment of those diseases.Understanding the anatomical relations forms the basis for all the surgical broad specialties in medical sciences. The department has a full fledged teaching programme which include. Theory classes in Gross Anatomy, Histology & Embryology. Tutorials in Gross Anatomy, Radiology & Clinical Anatomy. Regional & National conferences. Part completion tests, Internal assesment for both theory & practical are conducted at regular intervals to check the progress of the student. MCQ tests are also held which helps the students in their PG Entrance exam preparation. Weak students are helped by mentors in overcoming their obstacles. The faculty of the department of Anatomy also take part in integrated teaching programmes of the institute, different academic progremmes in the institute like CMEs and guest lectures. Students are also motivated to take part in celebrating National programmes and WHO day programmes. Future plans :- The anatomy department is having a plan to establish a well equipped, functional and service oriented Genetic Lab in next 5 years which will help us to go for cytogenetic studies of congenital anomalies and syndromic patients and also to evaluate the infertile patients and give them Genetic Counselling. Biochemistry is a branch of medicine involved with the study of chemical processes within and relating to living organisms for understanding human health and diseases as normal biochemical processes are the basis of health and most of the diseases have a biochemical basis. It includes study of different types of molecules in hopes of bettering technology and medicine. In routine clinical practice, biochemistry deals with analysis of bodily fluids for diagnostic and therapeutic purposes. The Department of Biochemistry, Great Eastern Medical School and Hospital was established in the year 2010. It is located at ground floor of college. The faculty in this department are qualified, well experienced and are involved in teaching programmes fulfilling the requirement of undergraduate as well as postgraduate courses. To provide Clinical biochemistry Laboratory services to patients attending Great Eastern Medical School and Hospital. Undergraduates are trained to acquire knowledge to integrate molecular events with functioning of the human body in health and disease as well as taught basic practical skills for biochemical investigations in order to support clinical diagnosis of common disorders in the community. The various undergraduate courses handled in this department include MBBS, BPT, BSc (MLT) & BSc Nursing. The postgraduates are trained to acquire an in depth knowledge of the fundamental principles of the subject of biochemistry, so that they can apply this knowledge for understanding the basis of health and disease. This also helps them to pursue a career in one or more of the following facets of biochemistry teaching, diagnostic work and research. Postgraduates are also encouraged to present posters and papers in regional and national conferences. Lecture galleries with A/C, LCD projector and audiovisual equipment. Demonstration hall with LCD projector and audiovisual equipment. Clinical biochemistry lab, a part of central diagnostics laboratory is located at first floor of GEMS Hospital.It has experienced technical staff and provides diagnostic services around the clock.It has sophisticated IT enabled services which permits viewing of blood test results immediately after completion of analysis and also previous laboratory data of a patient if necessasary. Laboratory is strictly following Internal & External Quality control (CMC,Vellore) programmes. 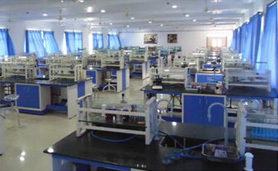 The department has a well equipped spacious research lab in 3 rd floor of GEMS college to carry out research projects. Currently, the biochemistry department is associated with Central Research Laboratory for pursuing advanced research using newer molecular biology techniques.The department also encourages UG students to take up ICMR – STS projects. Six Publications are published in the national indexed journals in the last 3 years. At present there are 4 ongoing projects in the department. The Department of Physiology took shape and became fully operational right from the inception of the Medical College in August 2010. Since then the department is actively engaged in teaching Under Graduate students and carrying out Research activities. Physiology department is situated in the left wing, 1st floor of the college building and is constructed according to the MCI specifications. The UG (MBBS) course is fully recognized by the MCI. The Department has full fledged infrastructure and equipment. All the faculty members are well qualified as per the norms of MCI. Faculty is well equipped to apply the subject on clinical basis and to demonstrate the subject practically. Didactic lectures, Practical sessions, Demonstrations are supported by enriched learning methods such as Tutorials, small group discussions, seminars, quizzes and monthly tests. Problem oriented analytical approaches are practiced to optimize the learning experience. Department Office Room with Computer, printer. Assignments covering important topic areas.